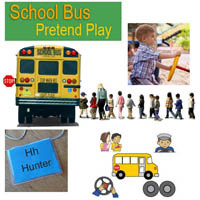 Preschool and Kindergarten Transportation Activities, Lessons, Games, and Crafts. Vroom, vroom! Zoom, zoom! Grease your wheels, start your engines, and get ready to roll. 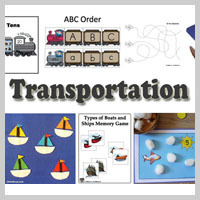 Have fun exploring the following modes of land transportation: cars, buses, and delivery trucks. 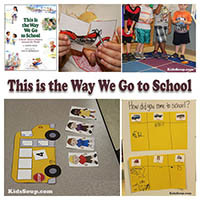 We can travel to school, to the park, to the grocery store, to Grandma's house, and just about anywhere else on land in cars and buses. And where would we be without delivery trucks? Just about everything is delivered by trucks from the food we eat to the clothing we wear, to the cars we drive, and to the materials our homes are made of. Let children stand in a circle. Explain to them that they will go with you on a car trip. 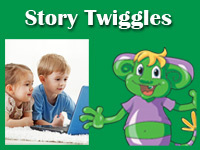 Explain that you will need their help with sound effects and to make the different actions you describe in your story. Let children pretend to steer a car. 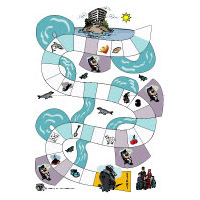 Describe a trip to a vacation spot. 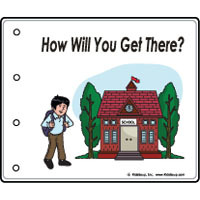 Let children turn left and right, stop at stoplights, stop at a store to buy some food, get out and in the car, start the car, park the car, drive backwards, etc. The next time around have the children take turns telling the story. 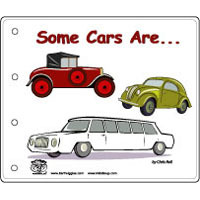 Show children a large picture of a car (preferably with all four wheels showing). Ask children to describe the car. 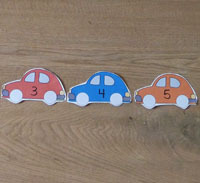 Next, ask children how many wheels the car has? Ask them to hold up that many fingers (4). Write the word "wheels" and the number 4 on the board. Next, ask how many lights, steering wheels, doors, and tires are on the car. 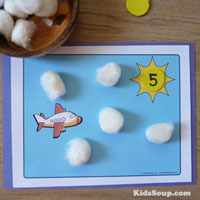 Write the words and numbers on the board. Show a truck picture and repeat the activity. Talk about their findings. 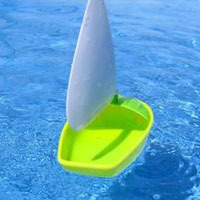 Let children create a paper plate steering wheel (see our craft section). 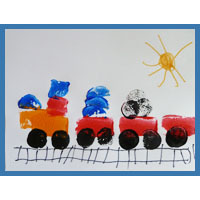 Have children line up in one or two horizontal rows, each holding their steering wheels. Stand in front of the children facing them. Explain that you will pretend to drive a car and that they have to follow you. Turn your back to the children and take them on a ride. Turn your steering wheel to the right or left and turn your body as well. Encourage children to watch and move with you. When you want to stop the car, press your foot down as if you're putting on the brake. Make the matching car sound effects. 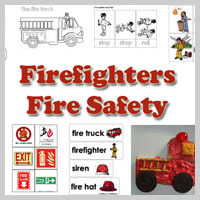 On a large poster board or brown wrapping paper draw or print out our printables for different destinations (school, grocery store, houses, church, fire station, police station, park, etc.) with winding roads. 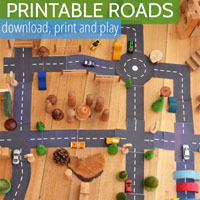 Provide small toy cars, trucks, and buses and let children drive along the roads to the different destinations. 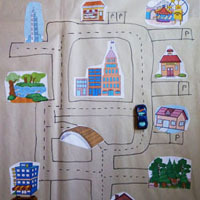 Let children describe where they going as they drive their vehicles. Take your child to a place where you and your child can safely observe vehicles, such as a parking lot. Ask him/her to tell you the colors of the different vehicles found there. List the colors as he/she lists them. 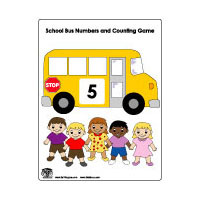 Then help your child make a graph showing how many vehicles of each color were counted. Have your child tell you which colors were the least and most common. Ask your child if he/she can name any colors that were not found. Let children cut cars and truck pictures out of magazines. On a table add masking tape to divide the table in half. 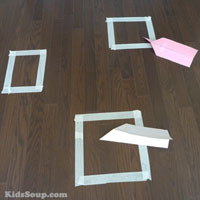 Write the words "Cars" and "Trucks" on index cards and place them on top of each column. 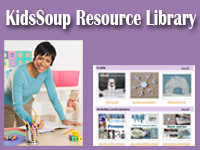 Invite children to sort the pictures and place them in the appropriate places. What Can a Tractor Trailer Haul? 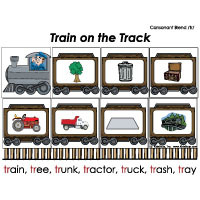 Ask your child to think of things that can be hauled in a tractor trailer. 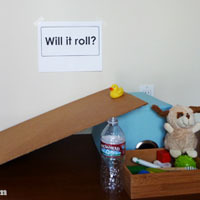 As your child makes suggestions, write them on a sheet of paper. 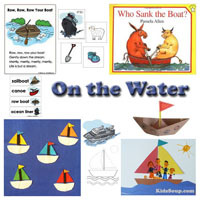 Point to the words as you read them back to your child. 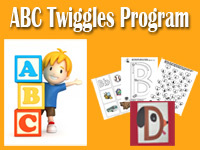 Encourage your child to repeat the words and to point to any letters that they recognize. Visit a bus depot with your child. While there, have your child look at the buses, where the tickets are bought, and any other amenities, such as a snack bar or gift shop. 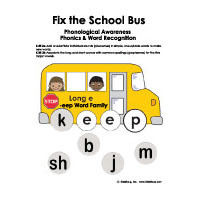 If possible, take a ride on the bus with your child. 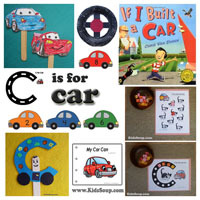 Have your child hold a hoop around his/her middle to represent a car, bus, or truck. Have him/her start his/her vehicle and drive it around. Provide obstacles on the "road," such as a bench to climb over to represent a hill or a mat to jump over to represent a bridge over water. Have your child drive slow and then fast. 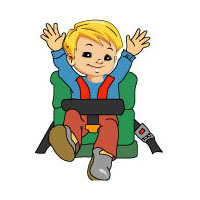 As your child "drives," play music to represent a radio in their truck. 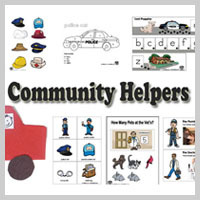 Have your child gather his/her toy vehicles and some sidewalk chalk. 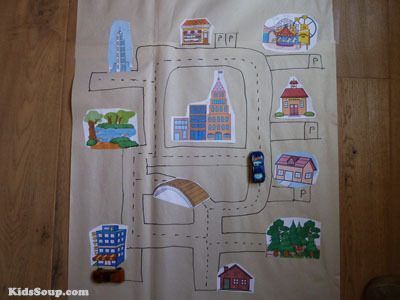 Go outside with your child and with him/her use the chalk to draw roads, road signs, buildings, etc. on the sidewalk. Then "drive" the vehicles on the chalk roadways. 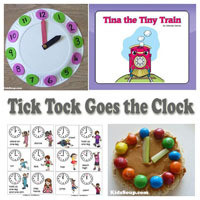 Provide your child with a celery stick and some peanut butter or low-fat cream cheese. Also have available sliced olives, cucumber slices, carrot sticks, and toothpicks. Have your child spread the peanut butter or low-fat cream cheese on the celery stick. 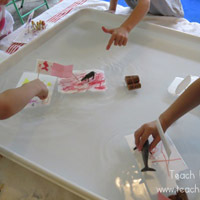 Then have him/her use the other items to make an edible "automobile." Cut two circles (wheels) out of black craft paper. Cut a paper plate in half. Add the two wheels to the flat edge of the paper plate. 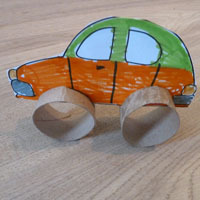 Add details to car with markers or crayons. 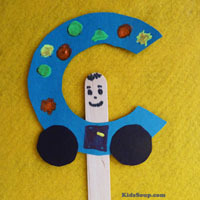 Encourage your child to create a personalized license plate from of a shoe box lid. The license plate can have random numbers and/or letters or be personalized with your child's name or a cute or funny saying. 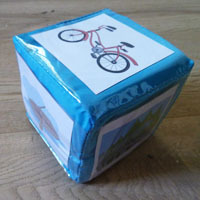 Your child could also use number and/or letter sponges and paint to make prints on the shoe box lid. (They could also cut large numbers and/or letters out of magazines and glue them to the shoe box lid.) For fun, attach the license plate to a riding toy. 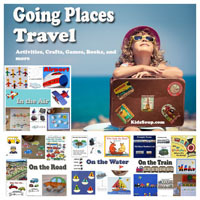 Provide children with car magazines (ask car dealers for some free samples). 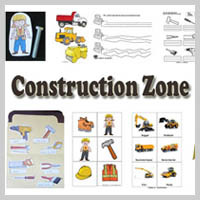 Let children cut out car pictures and let them describe the cards. 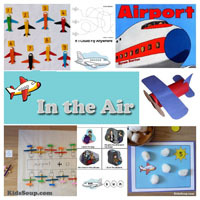 Let them create a collage by glueing their pictures on a piece of construction paper.